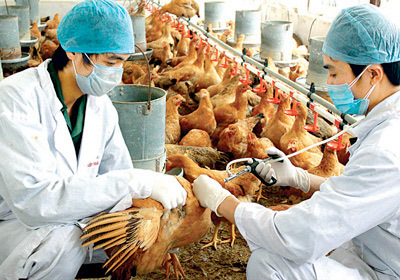 HA NOI (VNS) — The A/H5N6 bird flu virus has been found in the central provinces of Quang Tri and Quang Ngai, raising the total number of affected localities to five, confirmed the Department of Animal Health. The department under the Ministry of Agriculture and Rural Development said the virus was detected in a poultry farm in Quang Tri province's Trung Hai commune late last month. Around 350 out of 1,500 infected ducks have died. The virus has also killed 200 out of 1,100 infected poultry that tested positive for A/H5N6 in Quang Ngai province. Head of Quang Tri province's animal health department Le Thi Nga said local authorities had promptly destroyed infected birds and were sterilising poultry farms to contain the virus. However, there was a high risk of the virus spreading with the infected birds in Quang Ngai province coming from Dai Xuyen market in Ha Noi – the biggest poultry market in the country. Director of the Zone 1 Animal Health Office Le Minh Son confirmed with the Tien Phong (Vanguard) newspaper that the infected poultry in Quang Ngai province had been bought from Dai Xuyen market. However, the virus was detected in Quang Ngai a month later after the birds had been taken from the market, he said. "We are working with Ha Noi's authorities to test samples of poultry suppliers to keep this disease under close supervision," he said. "Currently, poultry varieties are healthy and show no signs of flu," he said. Deputy Director of Ha Noi Department of Agriculture and Rural Department Nguyen Huy Dang said that the department on Wednesday took samples from poultry businesses that had supplied duck to a farmer in Quang Ngai whose ducks had been infected with the virus. Test results would be available in the coming week, he said. The strain A/H5N6 of the influenza virus was detected for the first time in Viet Nam in central Ha Tinh, and northern Lang Son and Lao Cai provinces in mid-August. The A/H5N6 virus showed a 99 per cent similarity to the bird flu virus that killed a man in China's Sichuan province in April 2014. It has also been detected in poultry in Laos.